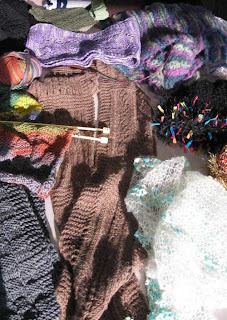 What a fiberlicious, yarny Show and Tell we had at my Sock Knitting Basics class last night! 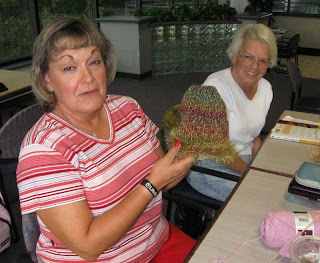 At the first session of the Sock Knitting class, I asked if everyone had done any knitting over the summer. My students mentioned several projects, so I asked if they would bring something to the next class meeting for Show and Tell. Let me tell you, it was a fiber feast for the eyes and the fingers! Sharon knits chemo caps with a church group. Jane (left) with a lace mohair scarf. 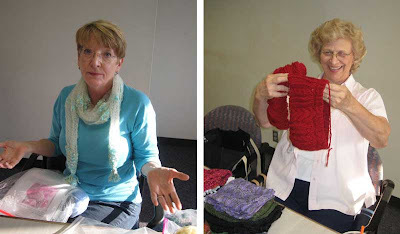 Lois (right) shows a cabled wrap for her dog. Check out Lois' pile of scarves in front of her! The knitters shared knitting and pattern tips, discoveries they learned by working on these projects, sources for favorite knitting patterns and yarns, where to find the "sale bins" and the stories behind the projects. All this is what knitting and sharing our passions for the fiber arts is all about! 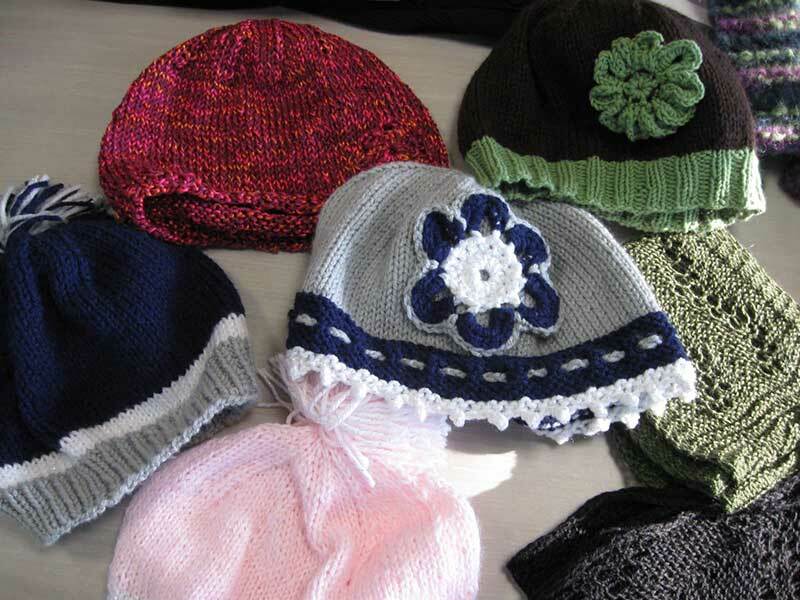 All kinds of knitted hats with trims and embellishments. After an inspiring Show and Tell, we got down to the business of sock knitting. 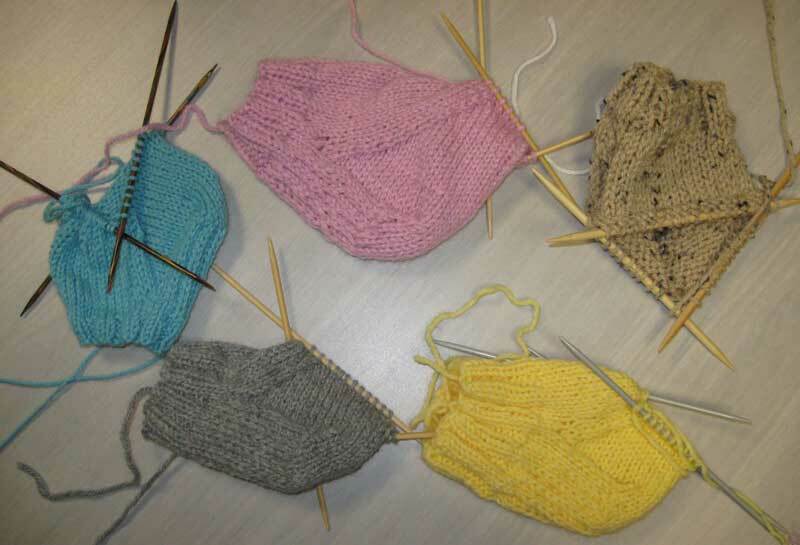 My students sailed through the magic of the heel turn, navigated the gusset and were cruising along on the decreases for the toe by the end of the evening. Next week begins a four week class on No Fuss Color Knitting! See you then. Sock Knitting Basics class projects. Veronica, you must have so much fun everyday. Your classes are always full of fun, at least that how it looks from the photos you post! We have a blast in the knitting and quilting classes! 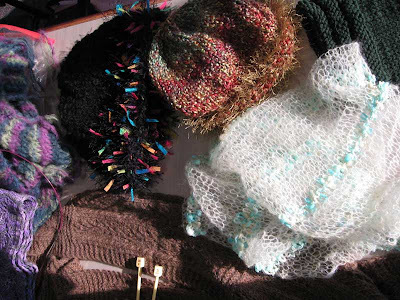 Can't go wrong when you're working with color, pattern, fabric and yarn. And, my students are so eager to learn. I love that part. How does fiber get to be yarn?